I am part of someone else’s blur. For Gary Numan — who is Tubeway Army — the last few days have been a blur of brand new excitement and confusion. His song ‘Are “Friends” Electric?’ has surprisingly sneaked into the Top 30. The first few singles are pressed as an attractive picture disc, which pushes the single into the lower part of the chart. The single then receives some airplay and, not being especially repulsive, slides a little deeper into the charts. There then comes the invitation to appear on Top Of The Pops, which coincides with an appearance on The Old Grey Whistle Test. The single then strolls into the Top 30. For Gary Numan all this has happened within a month. Three weeks ago no one wanted to talk to him. Except me. Now there’s a queue. And I’m at the end of it. 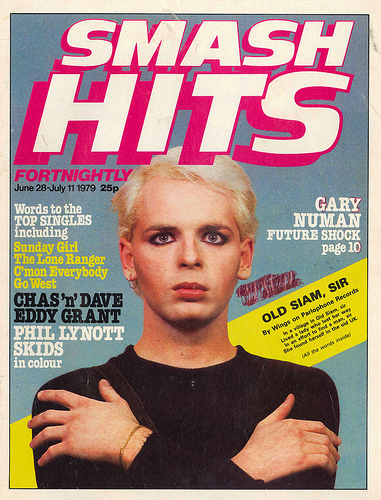 read the rest at: The Rock’s Backpages Flashback: Looking Through Gary Numan’s Eyes | Rocks Back Pages – Archives – Yahoo! Music. PreviousKilling Joke 2012, volume 12, Killing Joke cider!!!?!!! !